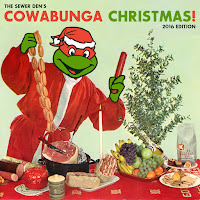 TMNT holiday ornaments are no stranger to The Sewer Den. I've shared dozens of them over the years. But, I don't always have a complete set. That's one of the most frustrating aspects of TMNT collecting - there's 4 of everything! There's a set of pull puppet ornaments that fall into the incomplete bucket. Leonardo and Raphael have been lingering around my collection for ages, but their 2 other Turtles bros are missing in action. Now, I'm one step closer to completion with Michelangelo! What makes this ornament especially funny is its status when I purchased it. The seller claimed it was "brand new, still in its original packaging." Look at this thing! The yellowing plastic has been stapled to its cardboard backing, the days of its original glue are long gone. Not exactly something you'd see on store shelves, even in the 90s. The sellers trickery doesn't matter much to me though. The ornament inside is A-OK, especially for the cheap price I paid. For a few bucks, I'm one step closer to completing this set. 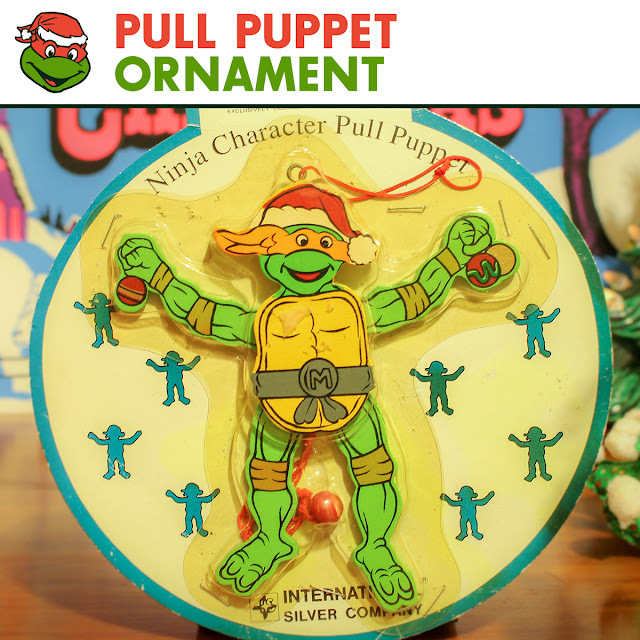 Pull the little red string and the Michelangelo ornament becomes a true ninja. Your Christmas tree will feature some of the best karate chops and leg kicks on the block. TMNT ornaments like this are the best of the bunch. They're a killer combo of unique and festive. You'll be proud to have the Turtle Powered puppet ornaments out for the season. And if you have a complete set, then it's even more impressive! I was just looking for the Santa ones like this, I didn't even know that they made TMNT ones, guess I have to start my search for them for next year, thanks! They're so fun! Pretty decent size too. If you can find one cheap, scoop it up!